Phoenician was a language originally spoken in the coastal (Mediterranean) region then called "Canaan", "Phoenicia", and "Pūt". 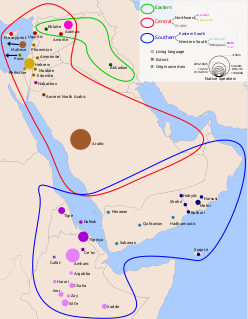 It is a part of the Canaanite subgroup of the Northwest Semitic languages. Other members of the family are Hebrew, Ammonite, Moabite, and Edomite. Biblical Hebrew, also called classical Hebrew, is an archaic form of Hebrew, a Canaanite Semitic language spoken by the Israelites in the area known as Israel, roughly west of the Jordan River and east of the Mediterranean Sea. The term "Hebrew" was not used for the language in the Bible, which was referred to as שפת כנען or יהודית, but the name was used in Greek and Mishnaic Hebrew texts. It is more or less mutually intelligible with modern Hebrew. The cuneiform ab, and ap sign, is the cuneiform sign used for the syllables ab, or ap, or the vowel and consonant usages of a, b, or p. In the Akkadian language b-and-p are interchangeable; also in cuneiform texts, any vowel of the a, e, i, u can be interchanged with another. Also for the 'ab/ap' sign, there is a capital letter (majuscule) usage as a sumerogram, found in the Epic of Gilgamesh for AB, Akkadian language for šību, "elder". 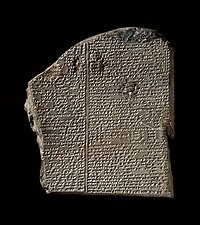 The cuneiform di sign, also de, ṭe, ṭi, and sumerograms DI and SÁ is a common-use sign of the Epic of Gilgamesh, the 1350 BC Amarna letters, and other cuneiform texts. 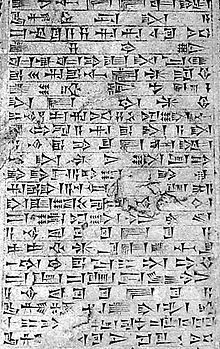 In the Akkadian language for forming words, it can be used syllabically for: de, di, ṭe, and ṭi; also alphabetically for letters d, ṭ, e, or i. Some consonant-pairs (d/t), are also interchangeable.